As you may know, Microsoft has jumped into the tablet market by bringing out its own Surface tablet and the device will be officially available from October 26 after the Windows 8 OS is launched. And now the 10.6-inch Windows RT running Surface tablet is up for pre-order in the US and the 32 GB variant starts at $499. It was previously rumoured that the Windows RT running Surface tablet will be priced no less than $599 and Microsoft has decided to stick with a $499 for the 32 GB variant minus the Touch Cover bundle. If you wish to buy the new cool Touch Cover along with the Surface, then you need to shell out $599 for the 32 GB version, while the 64 GB version will arrive with a Touch Cover and is priced at $699. 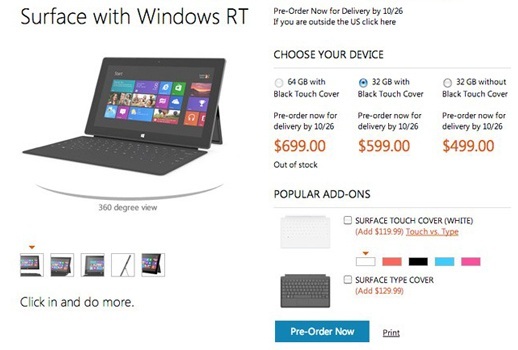 If you also choose to buy the Surface Type Cover individually, it will set you back $129.99. The tablet is available on pre-order over Microsoft Store and the prices are for the US only. It seems we will have to wait a few more days until we hear about the global availability of the Surface tablet. Update: The initial stock of the 32 GB Surface without cover seems to have been exhausted and Microsoft has updated the page with ‘Order now for shipment within 3 weeks’ tag, while the 32 GB with Black touch cover and 64 GB with Black Touch cover versions are still available for delivery by 26/10/2012 in the US. Also check out the first advertisement that Microsoft has released to promote the Surface tablet, which is just so cool!